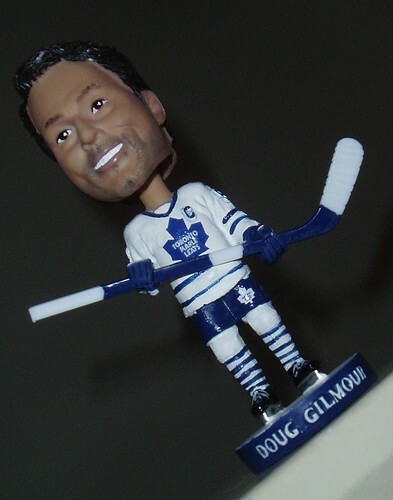 Here's the Doug Gilmour bobblehead doll they gave us at the Marlies game last Saturday. It's way better than the Tomas Kaberle bobblehead they gave out last year. Kaberle is currently in three pieces, headless and without a right arm. And, Kaberle had a big sponsor sign on it whereas Doug Gilmour doesn't. He's the perfect size, the right durability and sponsor-free. Another win for the Killer. oh man how do i get one of those? You can score a Matt Stajan bobblehead at the Marlies game Sunday. I'm going Saturday b/c I have plans Sunday, or I'd try and score an extra one for ya. A Matty Stajan is almost as good, right? wow, is dougie ever tanned!